Mini lemon cheesecakes are the perfect treat paired with whipped cream, berries and homemade blueberry sauce! These mini lemon baked cheesecakes are deliciously indulgent without being overly sweet. They’re a few bites of pure cheesecake heaven. It’s safe to say that I love cheesecake. I think that is pretty evident with the amount of cheesecake recipes I share. But as much as I love those cheesecake recipes they often make really big cheesecakes, which is way too much for us to eat so I often end up slicing up pieces to a give to my family to help out! These mini cheesecakes are a little less intimidating to make than regular cheesecakes. They don’t need to be cooled in the oven and are less likely to crack. Plus, mini bakes are cuter and because they’re smaller that means you can eat more than one and they’re even easier to share. To make these cheesecakes, start by lining a 12-hole muffin tin with paper cases. The cheesecakes start off with a buttery digestive biscuit base, which is made by combining biscuit crumbs with melted butter to bind it. The lemon cheesecake is made by beating cream cheese with lemon sugar. The lemon sugar is made by rubbing the sugar and lemon zest together with your fingertips. Sounds weird, but it helps release the natural oil from the lemon, which flavours the sugar beautifully. After beating the cream cheese and sugar until fluffy add a tablespoon of lemon juice and a couple of eggs and drop of vanilla extract. That’s the cheesecake topping ready to go! Scoop a few tablespoons of the cheesecake mixture onto the pre-baked biscuit bases and then pop the tray in the oven and bake for 22-24 minutes or until the cheesecakes are almost set in the centre. 1. Preheat oven to 170°C / 150°C Fan / 325°F/ Gas Mark 3. Line a 12-hole muffin tin with paper cases. Set aside. 2. To make the biscuit base: Combine the biscuit crumbs and melted butter until combined. Evenly distribute the biscuit crumbs between the paper cases – approx. 1 tablespoon or so in each. Press down slightly into an even layer. Bake for 5 minutes until toasted slightly then remove from the oven and leave to cool slightly. 3. To make the cheesecake: Beat the softened cream cheese for about a minute until smooth. In a small bowl combine the sugar and lemon zest. Using your fingertips rub the lemon zest into the sugar until it’s fragrant. Add the lemon sugar to the cream cheese and beat again for another minute or two until the mixture is fluffy. Add the lemon juice, eggs and vanilla and beat until smooth and all the ingredients are thoroughly combined. Scrape down the sides and bottom of the bowl. Spoon the cheesecake on top of the pre-baked biscuit bases. Bake for 22-24 minutes or until the cheesecakes completely set in the centre. Once the cheesecakes are baked place the tray on top of a wire rack and leave to cool completely to room temperature. Once cool chill in the fridge for at least 4 hours or preferably overnight. 4. To make the blueberry sauce: Place the blueberries, lemon juice and icing sugar in a small saucepan. Heat gently and cook for a few minutes until the blueberries break down and the sauce has thickened. You can leave the sauce with chunks of blueberry in it or you can strain it through a sieve like I did. Chill the sauce until cool – I usually make mine ahead of time and chill it overnight. 5. To serve, remove the cheesecakes from the paper cases. Top with whipped cream, fresh berries and a drizzle of homemade blueberry sauce. 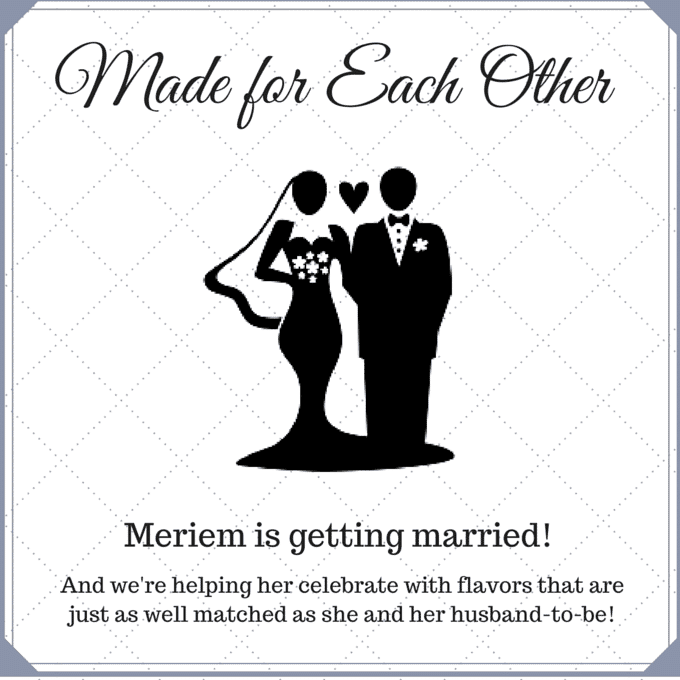 Thank you to Nora of A Clean Bake for organising the bridal shower and getting us all together to celebrate Meriem. 5 bloggers and myself are sharing recipes including flavour combos that are made for each other. Check out the menu below and enjoy all the delicious recipes from my friends! These are simply beautiful Jessica! Thank you so much for being a part of my shower, I love mini cheesecakes and I am super excited to try these! These mini lemon cheesecakes look absolutely delicious! I love how easy they are to make, too! Thanks Marsha! Love mini cheesecakes because they’re super easy to prepare! Perfect size for me! Yuum! These look absolutely gorgeous and so mouthwatering. Thank you so much for participating in the shower! I love your cheesecakes, Jess – keep ’em coming! These mini ones are fabulous. So pretty, and great tip about rubbing the lemon into the sugar! These mini cheesecakes are adorable. Is it mini cups tinpan you use normal size cups? Hi Janne 🙂 For these cheesecakes I used a regular sized cupcake/muffin tin and filled the cups with paper cases. Hi Jessica. Once again another delicious recipe from you. I didn’t have enough cream cheese so used half cottage cheese and half Philadelphia light and i am really pleased with the result. I would imagine if using Canderell instead of sugar that these would be a fairly low fat treat. Hi Elsie! Great idea using cottage cheese and it’s good to know that it works in this recipe. I’ve never tried adding sweeteners instead of sugar but I’m sure it would work out fine. Glad you enjoyed these cheesecakes! Hi Nati – thank you so much for your compliment. I currently use a Sony A58, it’s a great camera for food photography. Thank you for the camera info. I am making these mini heaven this weekend for a get together!